Here's another music video featuring the bicycle and a healthy portion of Cycle Chic. A group called Headlights with their single 'TV' from their debut album 'Kill Them With Kindness'. Really quite lovely. Cool bike, cool and casual people. Thanks to Colin for the heads up. And while this is not a music video, it certainly is Brasil Cycle Chic. It's an advert for an auto insurance company who are promoting the bicycle. Nice irony. Makes me long for Brasil and Rio. Beautiful cinematography. Here's a fun t-shirt design now available in our online boutique. These signs used to be standard in Denmark, featuring a dapper cyclist on a normal bike and complete with a brimmed hat. Let them all know that a stylish cyclist is on the way. 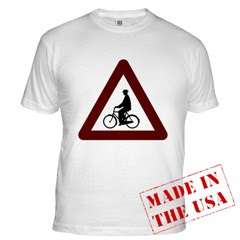 There is a gentleman's t-shirt [pictured] and a couple of ladies styles. Ed- If I was wearing that shirt, I would make it very chic. It ain't the shirt, it's the person in it! Pretty landscape and a lot of bicycles everywhere.